After being away for several days last week, I always enjoy taking a walk around the back yard to check on the plants and trees and see how things are doing. I am amazed at how things are growing and even notice more changes every day. Below you can see the twine that I have tied onto a tall shepherds hook for some gourds to climb and hopefully help shade the melons that I have planted. There are a lot of fun things in this garden. 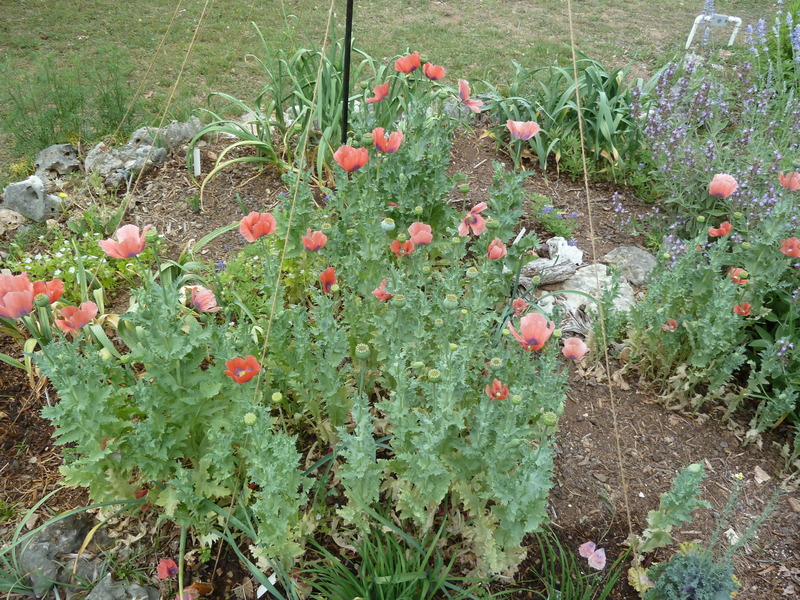 The poppies I seeded this winter are flowering. I gathered the poppy seeds from a neighbor and they where a deeper red color, mine seem “faded” in color, but still very beautiful. I seeded some larkspur at the same time and they are growing and just starting to bloom. 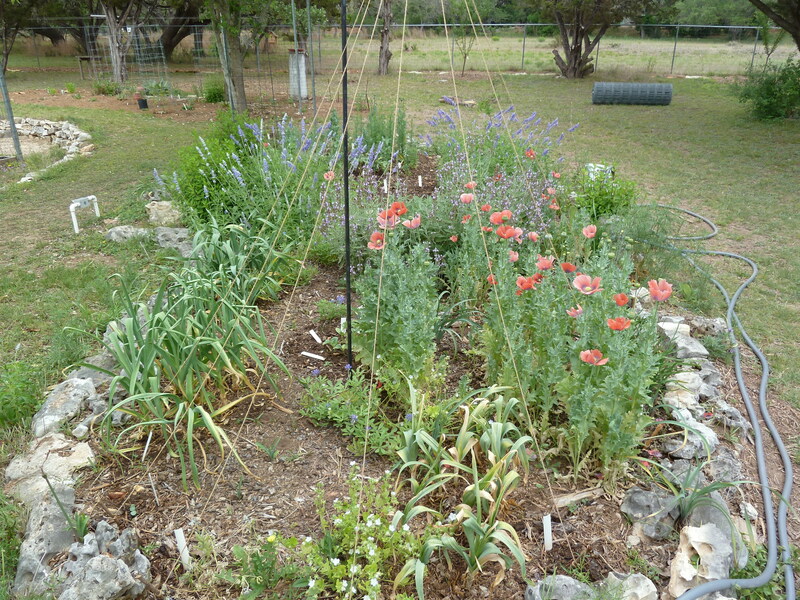 I also seeded with some orange poppy seeds and a purple lupine, but those did not come up. There are three clumps of garlic in that garden area. One clump is original to the garden from the original owner of the house. I do not know what kind it is, but I like it. I planted another patch this year and then received some from a neighbor when he was thinning his garlic patch. All seem to be growing well. To the right edge of the above photo I have a huge common sage plant that is blooming a nice lavender color and it is alive with happy bees. I planted that sage last year from a 4″ pot. I can’t believe how big it is now. The salvia in the above photo is blooming beautifully right now. I transplanted this two years ago from the ditch in the front yard. I do not know the name of it, and it is very drought resistant and heat tolerant and when given some water just flourishes. Another benefit to this plant is that it is also deer resistant so I have transplanted it to a few areas in the front and plan to do a few more this year yet to get them establish where I want it. This plant has increase in size each year. Since we have had no rain in many many months I decided to sprinkle The Pool Gardens to help germinate the poppy, blue bonnet and lupine seeds I scattered this winter. This salvia has flourished with the little water it gets, giving me such a deep blue-purple flower and the bees are enjoying the flowers too. 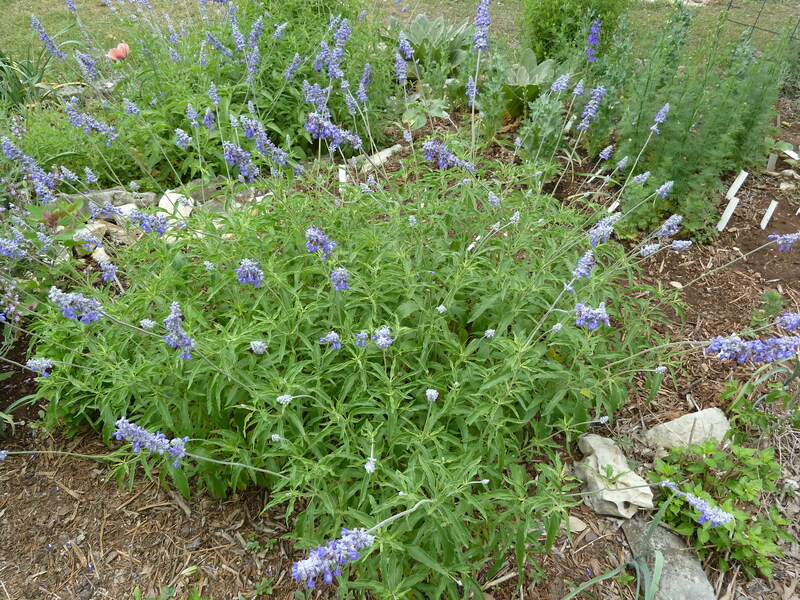 It has been a stunning garden with the blues of the blue bonnet, the lavender-blue of the sage and the dark blue-purple of this salvia. Now the poppies are adding a splash of color too. Soon the larkspur will add their deep blue-purple too. I have just planted some zinnia, tithonia and borage seeds in this garden and those should be coming up soon giving a new splash of color out there. These two photos above are from the same apple tree. 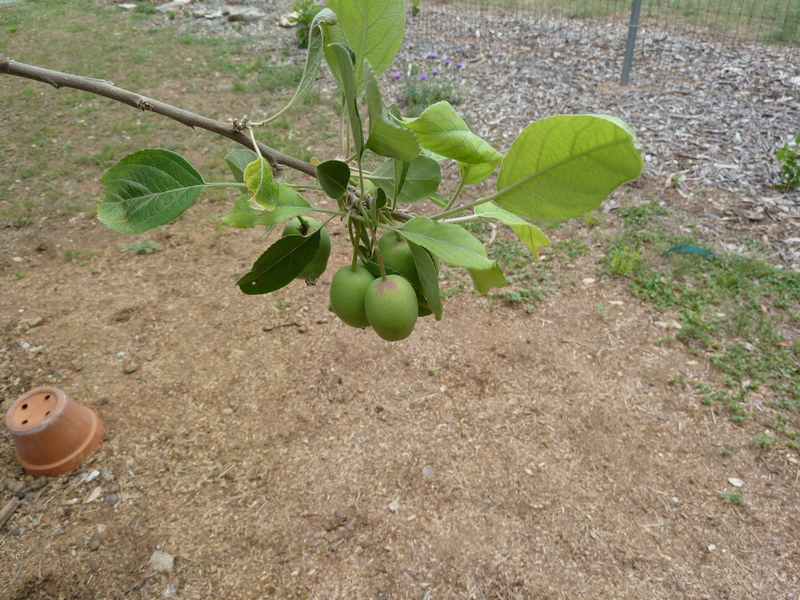 An apple tree with 4 grafts that was planted in January of 2010. I really didn’t expect to see fruit until next spring at the earliest, but there it is right in front of my eyes. There are a few clumps of four-five apples, that seems to be a lot for such a young tree, so I think I will thin them out a bit. One of the grafts did not make it through the first winter and the third graft, a Golden Apple is just starting to leaf out. It is meant to bloom later than the other two. The two plum trees that were planted at the same time do not have any fruit on them and neither does the pear tree. The fig tree planted at the same time is slowly coming to life. That is alright, they are all still young trees. I did lose the Meyer Lemon tree. I will plant another one this winter and hope for the best. The two peach trees I planted this past winter are leafing out nicely. I hope you have some great things happening in your gardens this spring (northern hemisphere readers.) I know many of you are in different planting zones and also hemispheres. Some of your summer gardens are winding down and you are moving into winter gardens while others patiently waiting for it to be warm enough to plant your spring and summer gardens. Where ever you are, take time to enjoy those little changes every day. This entry was posted in Fallen Oak, Flowers, Garden, Herbs. Bookmark the permalink. Wow, things are really coming alive there. How wonderful to see fruit already. Gives me hope that someday up here it will be Spring. 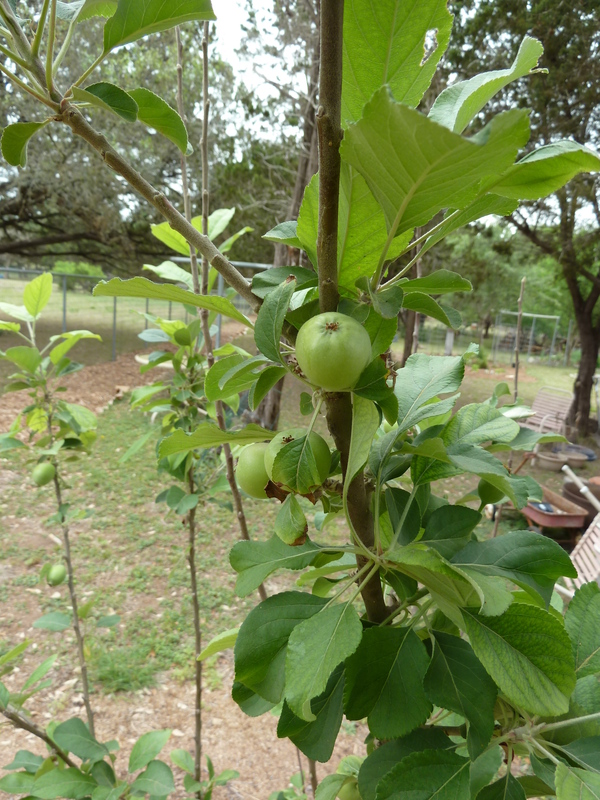 Hi Jane – I was thrilled to see the apples growing, especially since the tree is so young. I am seeing more tomatoes starting to grow every day too. Spring will get to you soon! I JUST KNOW IT!